Christine Werthman (@CWerthman) is a contributing writer to Complex. Earlier this week, U2 crashed Apple&apos;s big iPhone 6 announcement party to perform their new single, "The Miracle (Of Joey Ramone)" for the crowd in Cupertino, Calif. The song comes from the band&apos;s new album, Songs of Innocence, an 11-track release now available for free on iTunes. Turns out that while iTunes users have been picking up the new album free of charge this week, they&apos;ve also been buying up other U2 albums. 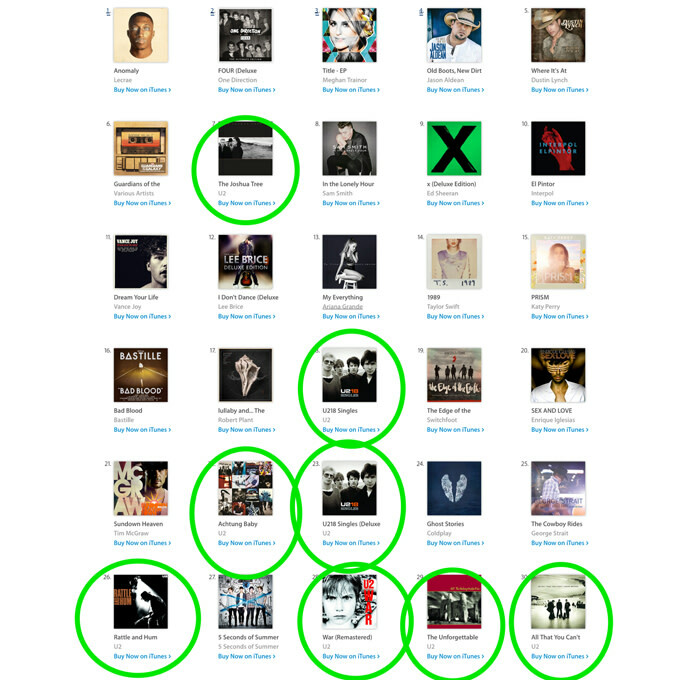 As of right now, U2 is occupying 20 out of the 100 spots on the iTunes album chart. The remastered version of The Joshua Tree (1987) has the highest spot at No. 7, and other big sellers from the band, like Achtung Baby and War, also show up on the list. So attention artists out there: Giving away your music for free—you should try it.